The Planning Act (Section 42) allows the City to establish an alternative parkland dedication rate to require the dedication of parkland or cash-in-lieu to purchase or improve parkland as a condition of development or redevelopment. The City’s current alternate rate is 0.4 hectares per 300 units capped by site size. Over the past 12 years, the intensity of development has significantly increased although the alternative rate has remained unchanged. A new rate is required that reflects today’s development environment. A parkland dedication is a certain amount of land on a development site, or if the site is unsuitable for a park, a fee in-lieu of land, that builders are required to set aside as part of new development. Section 42 of the Planning Act sets out a standard rate and limits for parkland dedication and permits, with certain limits, municipalities to set an alternative dedication rate. The City’s current alternative rate for parkland dedication is 0.4 hectares per 300 units with caps based on the size of the development site. Small development sites under 1 hectare (2.5 acres) have a parkland dedication requirement capped at 10 percent of the development site. The alternative rate cap does not consider the density or number of residential units. Small sites less than 1 hectare (2.5 acres) make up approximately 90 percent of development sites in the City’s Centres (Downtown, North York Centre, Yonge-Eglinton Centre, Scarborough Centre and Etobicoke Centre). The City may also require developments to pay cash-in-lieu of parkland dedication if an on-site parkland dedication is not suitable. Cash-in-lieu tends to occur with small development sites where a land dedication would result in a small park of limited function, or if the provision of the park would inhibit development on the rest of the site. 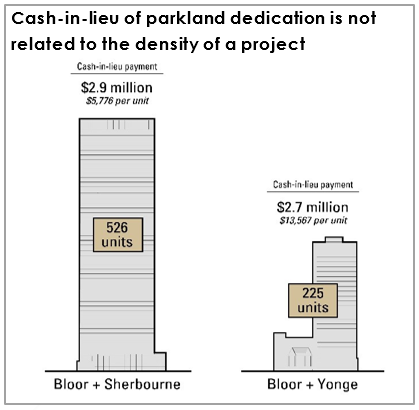 The amount of cash-in-lieu is determined using the value of the capped parkland dedication and the overall development site value. The image shows how the current cap, based on site size and does not relate to parkland demand generated by growth and intensity of development. City staff are updating the Official Plan Parks and Open Space Policies and bylaw for the City’s alternative parkland dedication rate. An increase in land dedication requirements or cash-in-lieu payments will enable the City to purchase more parkland and invest in more parks improvements local to the development and across Toronto. City Council has the option to set city-wide or local area rates, which would match the boundaries of local plans and be responsive to specific development contexts. City staff are developing the city-wide parkland strategy, which is expected to be brought to City Council for consideration in 2019. Council has approved new secondary plans and the parks plans for the Downtown Plan and the Yonge-Eglinton Secondary Plan areas. City staff are undertaking analysis, through the parkland strategy, to support and recommend an updated city-wide alternative parkland dedication rate(s) and new rates which will correspond with the boundaries of the Downtown Plan and the Yonge-Eglinton Secondary Plan areas. City staff are also analyzing other tools and mechanisms that support parkland acquisition and development, including the Cash-in-Lieu Allocation Policy and incentives for off-site and pooling land dedications. In 2017, Executive Committee adopted a review of the City’s Alternative Parkland Dedication Rate, which is one of the background studies required to complete Phase 1 of the Five Year Review of the Official Plan’s Parks and the Open Space policies. Other Phase 1 background studies include the Parks & Recreation Facilities Master Plan (2017), the Ravine Strategy (2017) and the parkland strategy (2019). Together these studies will inform the issues to be addressed in the review of the Official Plan’s Parks and Open Space policies.